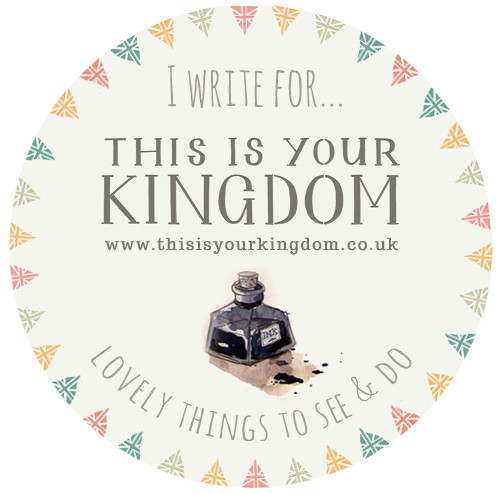 I don’t usually talk about new stuff on this blog but sometimes new things complement old things very well. 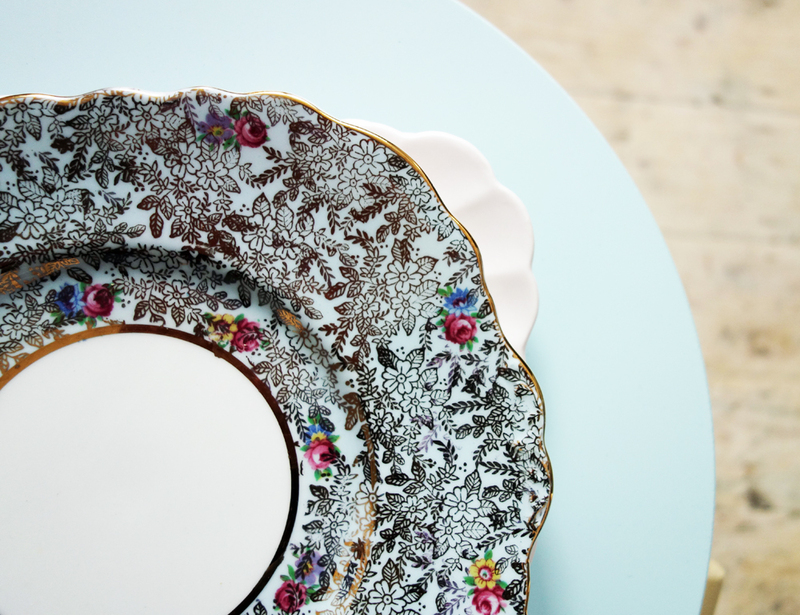 On a recent trip to Cambridge, I was pleased to find some vintage Colclough and Tuscan china cake plates hidden at the bottom of some shelves in a charity shop, dirty and unloved. As soon as I felt the edges of the plates I could tell that they were going to be special even before seeing the patterns. 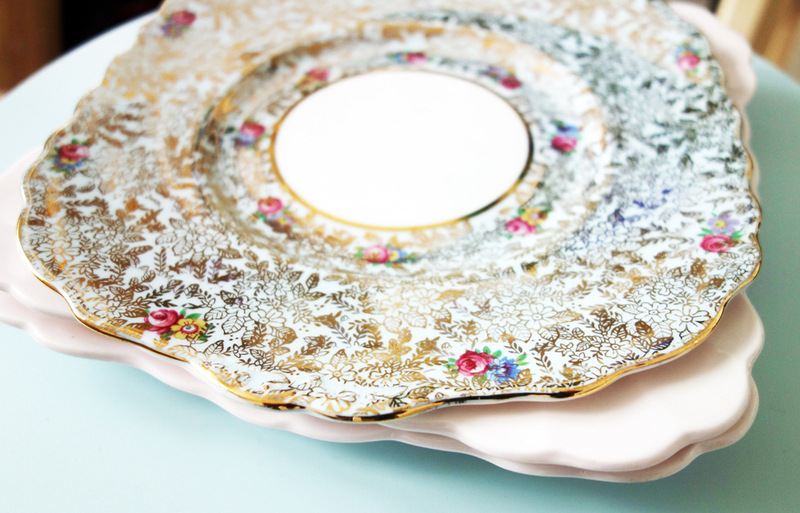 The Colclough plate is from around 1945-1948 according to the backstamp and it has the most beautiful sheen to it. The delicate blue, pink and yellow roses look like they’ve just come out of the factory! I wonder where it has been hiding all these years. I think I’ve only seen this pattern once before in a tea set that we sold a while back. That one had a lemon background whereas this one has a light blue one. 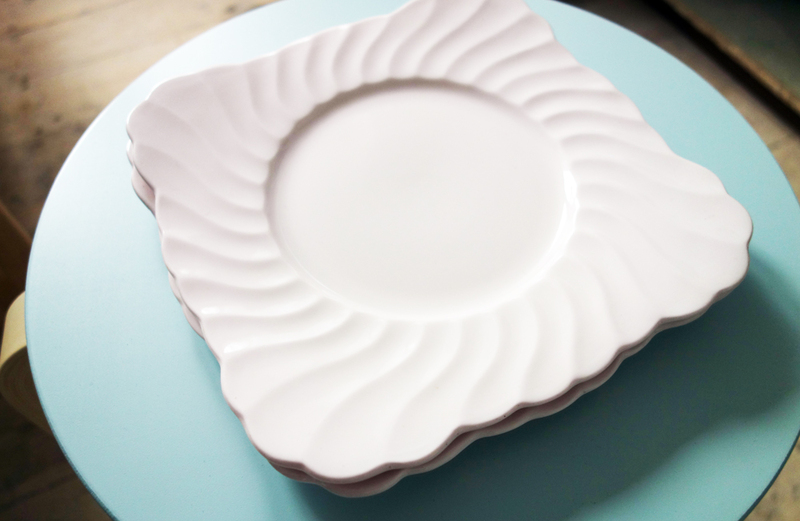 The other two plates I found are from Tuscan china’s Peach Bloom range. 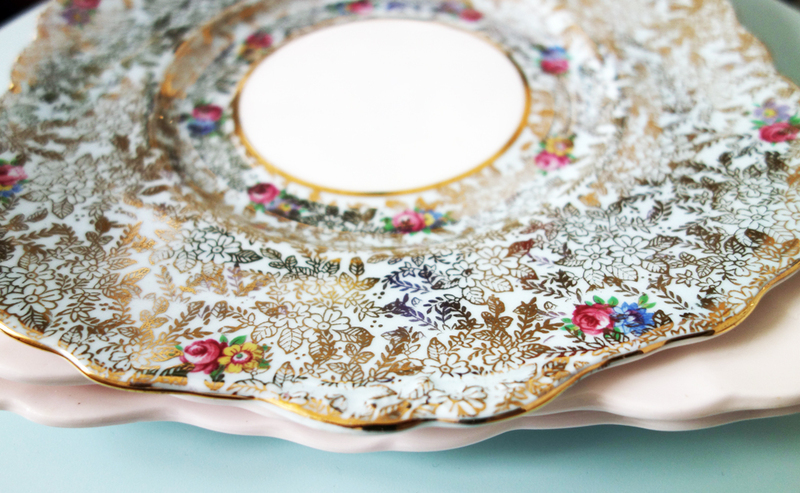 Unlike the Colclough plates, they have no pattern but the milky peach hue and the delicately-fluted edges are enough in themselves. 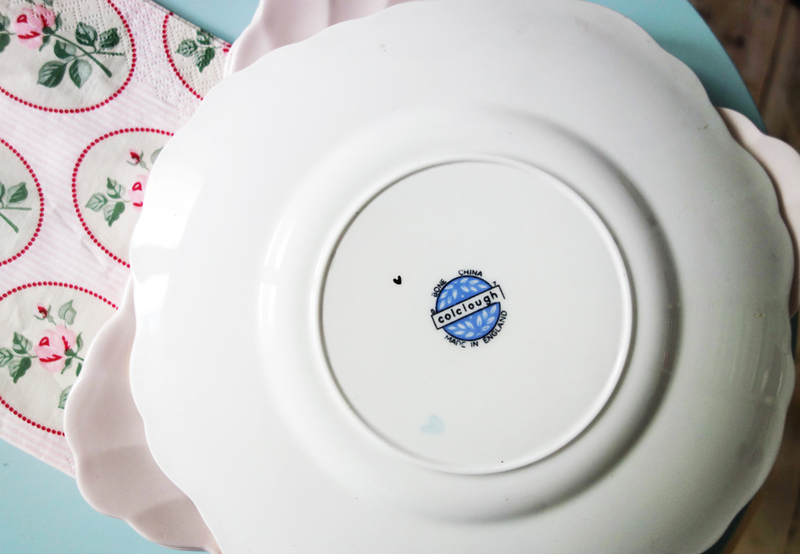 Tuscan china was made until the late 1960s and I think these plates are probably from the late 1950s/early 1960s. I put together a selection of Tuscan patterns along with the history of the company in a previous blog post. 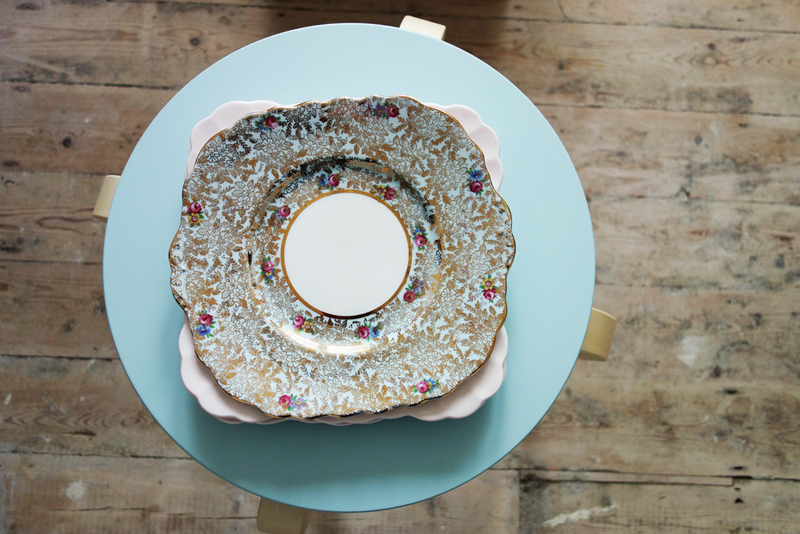 I photographed the plates on top of a baby blue wooden stool which is from Ikea’s Brakig range. I had to pop to Ikea the other day and had spotted the stools in a post on the lovely Modflowers blog and just had to get one. I think it’s based on a classic design by Arne Jacobsen. I love the simplicity of the combination of the slender form with classic block colours. I was tempted to buy another colour as well but restrained myself! 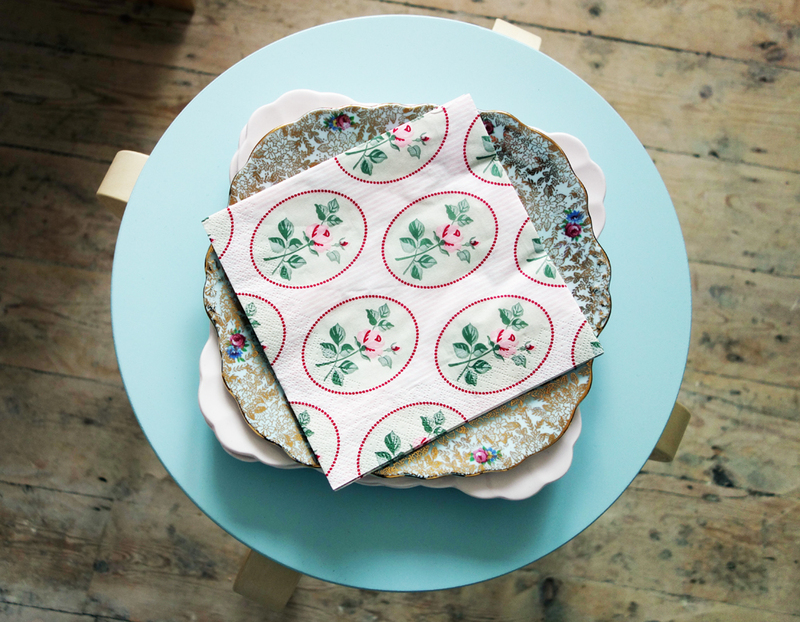 The napkins are also from Ikea – perfect for when you need some paper napkins for an impromptu tea party! All I need to do now is to decide whether to make cake stands from the Colclough and Tuscan plates or whether to leave them as they are. What do you think? Thanks for the mention Rach! I would leave the Colclough as it is – it would be a shame to make a hole in it right where that lovely little backstamp logo is! I agree about the Colclough. It’s one of those patterns that I don’t come across often so it would be a shame to drill it! Beautiful, my grandparents and Mum are from the Potteries and my Nana was a transferer, my friend Gill also used to make china roses for Crown Staffordshire. Check out Gladstone Pottery Museum. I went to Wedgewood as a child and painted a plate and made a Wedgewood blue and white jasper plaque my Mum still has it on the wall. Thanks, will do! I’m hoping to do a bit of a potteries pilgrimage later in the year.